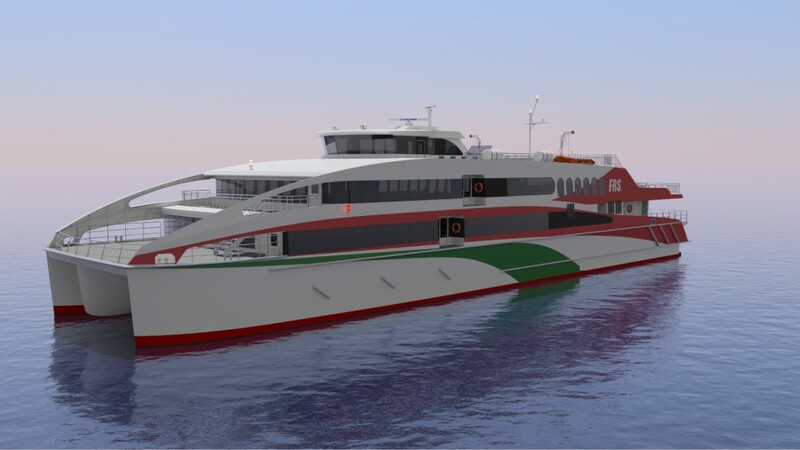 Austal Limited (Austal) (ASX:ASB) is pleased to announce the company’s sixth new commercial vessel order for 2016, with the award of a €15.47 million (circa A$22million) contract for a high-speed passenger ferry from Förde Reederei Seetouristik (FRS Group) of Germany. The 56 metre catamaran is a new design from Austal’s Australian based design team, adding to their successful portfolio of designs that has seen more than 22 similar-sized vessels constructed for commercial ferry operators around the world since 2002. Announcing the contract, Austal Chief Executive Officer David Singleton highlighted Austal’s successful strategy to pursue export opportunities that are strengthening Australia’s shipbuilding capability. “Export contracts such as this are integral to the ongoing development of our Australian-based design, procurement and engineering teams and provide terrific opportunities for them to share their skills and expertise in shipbuilding with our Philippines shipyard. This not only strengthens our local and overseas capabilities, but ultimately delivers great value to our customers,” Singleton said. Austal’s new design encompasses several key innovations including an optimised hull form that will minimise both fuel consumption and wake wash when operating on the River Elbe between Helgoland and the Port of Hamburg. The environmentally friendly ship has been designed with several features to improve the passenger experience with the use of energy efficient LED lighting technologies internally and externally to create mood, ambient and decorative lighting. Large windows in the superstructure and two open deck areas will offer passengers expansive views from throughout the vessel. The 35 knot, all-aluminium catamaran also features silicon type anti-fouling (with no biocides that can harm waterways), a sewage treatment plant and an engine exhaust arrangement that will allow catalytic converters to remove nitrous oxides from the main engine exhaust. Blue Sea Jet of China (1 x 42 metre passenger ferry, to be constructed by Aulong, Austal’s joint venture with Jianglong Shipbuilding). Construction will commence at Austal Philippines’ Cebu shipyard early in 2017, with delivery to FRS Group scheduled for March 2018.